Racing Brake Stainless Steel Brake Lines - Dezod Motorsports Inc - Home of the automotive performance enthusiast since 2002. Racing Brake Stainless Steel Brake Lines come with all the necessary components for a complete installation of front and rear axle. These lines are built to RB specifications, meeting D.O.T. Certification. 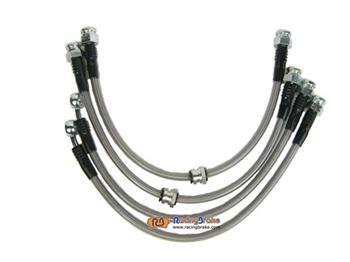 Stainless steel brake lines improve braking performance, eliminates the spongy feel of rubber hoses and provides superior resistance to corrosion.